The yellow-bellied marmot is the largest North American ground squirrel and closely related to the woodchuck of the East and Midwest. The yellow-bellied marmot is a heavy-set, brown grizzled mammal with white markings on the face and a rusty yellow belly. Adults are about 26 inches long and weigh from 5 to 11 pounds. This marmot sitting on the porch of a RMBL cabin was named Sunshine – the markings on his fur helped researchers identify him without capturing him (he also had a small tag on his ear). Marmots are widely distributed through the mountains of the western United States and are usually associated with alpine meadows, but they will also live in open lower elevation montane habitat. They dig permanent burrows in rocky outcrops or talus to den. Predators include the coyote, fox, badger, bobcat, golden eagle, hawks, owls, weasels and marten. Marmots are protected from predators by rocky habitat and a social system of alarm calls. When a marmot sees a predator, it whistles to warn it’s offspring and other marmots in the area, giving it the nickname “whistle pig”. In addition to predation, hibernation can be an important source of mortality. Marmots are vegetarians. They prefer to eat flowering stalks, but also eat the leaves of a variety of grasses and forbs. Marmots hibernate from late September or early October through mid-April to early May. Immediately following hibernation, and indeed, before emergence on heavy snow years, marmots mate. After 30-32 days of gestation, and 30-32 days of lactation, an average of five offspring emerge from their natal burrows. During the remaining active season, all age classes forage in the meadow, grow, accumulate fat, and prepare for hibernation, during which up to half of their summer weight will be lost. Because young must reach a minimal size and reproductive females must accumulate fat for successful hibernation, the short growing season restricts reproduction to once annually. Typically, a single male maintains a territory with a harem of one or more females, yearlings and young of the year. Virtually all adult males are immigrants to the sites, whereas most of the females are born there. Females form mother-daughter-sister groups that persist through time with extensive home-range overlap. All juvenile males disperse but only about half of the females do. 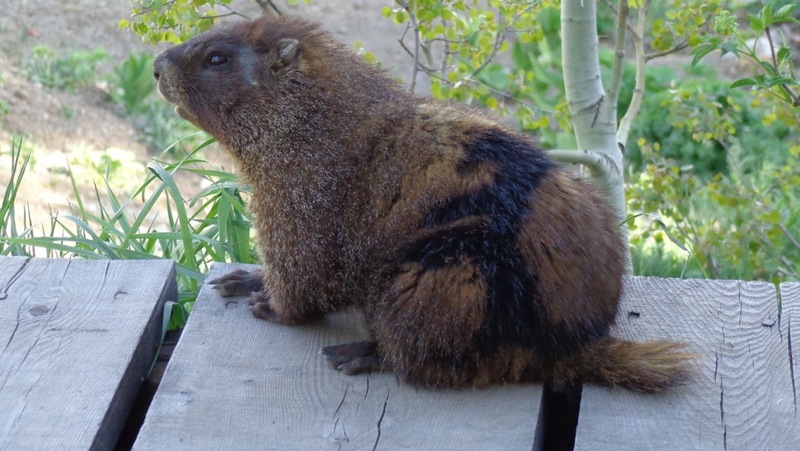 As the climate warms, marmots seem to be getting fatter and more abundant around RMBL. Listen to the 2010 interview with RMBL researcher Dan Blumstein on NPR. Or read a recent article highlighting RMBL marmot research published in Nature (2010). For more information about marmots, check out the yellow-bellied marmot page at the Encyclopedia of Life. Armitage, K. B. 1991 Social and population dynamics of yellow-bellied marmots: results from long-term research. Annu. Rev. Ecol. Syst. 22, 379-407. To learn more about marmot studies at RMBL, go to the Marmots of RMBL pages or follow the Marmot Minutes blog.